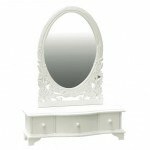 Dressing table mirrors are essential items for any dressing area. At Dooley’s, you can find a wide range of dressing mirrors, from traditional ones that will remind you of Victorian times to modern styles that are the perfect choice for contemporary bedrooms. Whichever the design of your home may be, you can be sure you will find the right dressing table mirror by browsing our collection. A bedroom is a space where not only do we get rest, but a room where we get dressed and get ready for a new day. Dressing table mirrors are indispensible items in any bedroom and they are at the same time a good way to enhance the looks of your room. At Dooley’s, you will find a large collection of dressing table mirrors, from which you can choose the perfect one that will fit the existing décor of your bedroom. Choosing the shape and size of a dressing table mirror should be done carefully, as this can change the entire appearance of your bedroom. Choose an oval mirror for a traditionally decorated bedroom and a rectangular one for a contemporary one. The delightful collection of dressing mirrors you can find at Dooley’s Furniture add a touch of elegance to any bedroom and complement any kind of dressing table. By browsing our selection of dressing mirrors you will soon discover that it has never been easier to update your bedroom. Just have a look at the dressing mirrors in our online store and you will be on the right path to revamping the look of your bedroom.